Cows must be milked regularly or they will get sick. So the milk they produce simply ends up being dumped. Ninety-five per cent of the federation’s 32,000 members are taking part in the strike, which adds up to nearly half of Germany’s total milk output going down the plughole. Milk producers in neighbouring Belgium and Austria have voiced their support of the protesters, and urged dairy farmers to join the strike or at least refuse to export to Germany to fill the gap. Dairy shelves in shops all over Germany are expected to be empty within a matter of days. The Austrian IG Milch Dairy Association called on kindergartens, schools and hospitals to stop serving milk. In Switzerland, 200 Zurich milk producers have followed the Germans’ lead by stopping deliveries completely. Meanwhile on Tuesday EU agriculture ministers met in Slovenia, where they were divided on the issue of the abolition of quotas that guard against over-production of milk and guarantee stable prices. Farmers argue that while their operating costs have risen, this has not been reflected in the price they are paid by retailers. 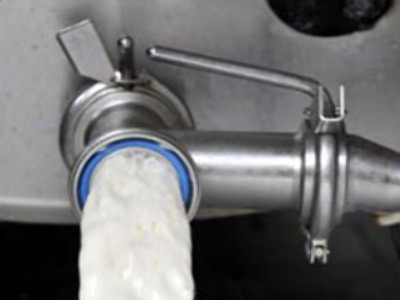 The strike is expected to last up to ten days, which could mean over 100 million gallons of healthy milk will go to waste.